As you all know, I love cookbooks. Basically all cookbooks. But it’s not every day that my good friends and colleagues publish a book, so this one has me extra excited! As with their previous book, Starters & Sides Made Easy is chock full of creative and inventive ideas, beautifully photographed dishes, and eye catching design, not to mention, helpful tips and engaging and entertaining writing. Seriously, this book has a way of drawing you in…and making you drool! One of the first things I noticed about this book was the excellent organization. Some people might think of starters and sides as it’s own category, but when you have an entire book devoted to them, categorizing can get tricky. This book is cleverly arranged into a category for vegetables, one for grains, another for meat and chicken, yet another for fish, one for dairy, and lastly, a sweet sides category. As you can see, the book really covers the whole range! 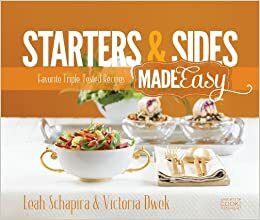 Next, as in their previous book, Starters and Sides has a wealth of kitchen knowledge (those authors know their stuff – as editors for both the world’s best weekly kosher magazine, Whisk, and CookKosher.Com, the world’s largest kosher recipe sharing site, they really have a ton of info to share!). Before they start on the actual recipes, the authors share a “building blocks” section, where they teach you things like how to roast vegetables, how to add flavor to your mashed potatoes and how to make perfect rice. They also include a comprehensive spice guide, and plating suggestions before every chapter! Another thing I love about this book is the variety and innovation of ideas. Always thought coleslaw was a mayonnaise loaded salad made with cabbage? Think again. In this book, coleslaw gets fried into mouthwateringly delicious looking balls! You probably noticed by now that I mention the photography in all of my cookbook reviews. Well, this book has breathtakingly beautiful pictures of wonderfully and smartly styled food. Lastly, a number of the chicken and meat recipes can easily be turned into mains, which is a nice bonus for the book! I don’t even know where to start here! I want to make basically everything in this book…from Shwarma Egg rolls to coleslaw balls and sticky red potatoes! The recipe I am most excited to try is their Crispy Beef. That dish is a favorite of mine at Asian restaurants, so I am really excited to try it at home! Another recipe I am dying to make is the Barbecue Noodles. Partly because they look so absolutely delicious, and partly because I was actually there helping out one day at the photo shoot, and I got to taste these straight from the source. And I can absolutely vouch for their awesomeness. Another recipe on my “I’ll make it as soon as I have a good excuse” list is the Falafel Cigars. Think hybrid between an egg roll, a falafel sandwich and a meat filled cigar, and you have a pretty good idea of why I am so enthralled by this recipe! I could go on all day, but I’ll leave you to buy the book and pick your favorites yourself! If you love to cook, and are constantly looking for delicious and creative new things to cook, you’re going to love this book. Specifically, the book contains a ton of ideas for holidays, parties, and other special occasions, so if you find yourself cooking for one of the above, and you’re stuck on the menu, this book will be a complete lifesaver! Also, if you are looking for a book full of simple and every day recipes…this book has them, but a lot of the recipes are for special occasions. As I just mentioned, the book is chock full of ideas for special occasions, but has fewer ideas for everyday suppers. Not to say that it doesn’t have recipes that are bound to make it onto your every day supper rotation, like sesame orzo, zucchini and scallion fries, or barbecue noodles, among others, but there are fewer of that type of recipe. My only other issue with the book is that many of the recipes require frying, making them both less healthy and not as quick to prepare. Overall, this cookbook is an excellent addition to your collection! It has delicious recipes, innovative ideas, inspired flavors, beautiful pictures and is guaranteed to make you drool! I really can’t say enough about this book…now go out and buy yourself a copy! 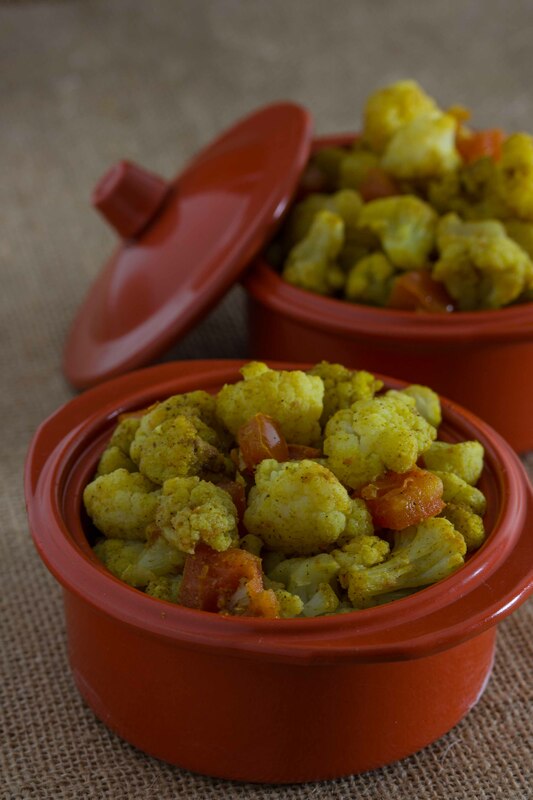 And now, for a sample recipe…this cauliflower dish is healthy and delicious and takes just a couple of minutes to throw together…how’s that for a winning recipe! Combine all ingredients except for lemon juice and toss to coat evenly. Spread in a single layer on prepared baking sheet and bake at 450 for 25 minutes. Sprinkle with the lemon juice and serve warm. Entry #1 – Leave a comment on this post telling me what is your go to starter or side dish recipe. Giveaway ends at 11:59 PM on Thursday, October 1oth. A valid email address or twitter profile must be provided. Disclaimer: I was sent a review copy of this book, and I know the authors well – and have the greatest respect for their food prowess. All opinions are my own. There are affiliate links within this post, which means that if you click the links here to buy the book you will help sponsor your favorite food blog! My go to side dish is lo mein. One box of pasta goes a long way and you can add whatever veggies you have on hand – mushrooms, baby corn, water chestnuts, snow peas, scallions. You can easily make it a main dish by adding some stir fried chicken strips. Everyone loves it. I already follow your blog. Great job! my go-to starter is salmon, made any number of ways. salmon cakes, grilled salmon, etc. versatile and healthy. I already follow @OvertimeCook on twitter! My go to start is definitely sushi salad. … goes every time! I’m already subscribed via email! My go-to easy side are turkey n pastrami wraps. I shmear layer of Russian dressing on a wrap, layer some Romaine lettuce, and some slices of deli meat. I cut it diagonally in half and put some extra dressing on side to dip into! My go to starter recipe is London broil salad. Love it! My go to side dish is roasted veggies. My go to side dish is roast vegetables. Good way to clean out the fridge and it’s delicious! Meat/chicken bourekas with a vegetable sauce atop,I receive your emails,liked you on Facebook……I love this blog! i love your blog and hope to win the cookbook. sides are always the hardest part of my menu planning!! Hi. We’ve never met…but having read the review, I think we will see more of each other. My go to is roasted veggies. They are so versatile and they pump up the flavor whether I turn them into a soup, throw them in some pasta, bake them in a cake or eat them before anyone else has a chance. Can’t wait to see the cookbook. Broccoli tossed with a bit of olive oil and some salt. My go to side is potatoes with spices. Go to side fish is green beans! I follow you via email and Facebook. My go to side is roasted canned potatoes with olive oil and spices or olive oil and dry ranch dressing mix. Go to side dish: The rice with pistachios and herbs from “Jerusalem.” It goes with EVERYTHING. You know I am one of your biggest fans on facebook. I have promoted your recipes and ideas daily. Love Love Love your recipes. My go to recipe for a great entree for special occasions is my enticing pepper steak served over a scoop of rice. Looks amazing, smells succulent and gets rave reviews every time! roasted sugar snap peas with sesame oil & sesame seeds! Liked u on fb!!!!! Would love to win! My go to starter is morrocan cigars! Always a hit. i like you on facebook!!!!!!!!!!!!! Butternut squash ravioli and crispy beef = phenomenal!!!! Hey miriam! I love your blog! I live by grove st in monsey so I believe we are somewhat neighbors! Would love to meet you one day! My go to starters is israeli dips…babaganoush, fried eggplant, chumus, matboucha….that’s like the main part of our friday night meal( if I dont have time to make we buy from “yanay dips” on horton drive. They are amazing! As israeli and authentic as it gets! A also subscribe to your emails for a few months now and love them! Fish (salmon) is my go to starter! Roasted potatoes are always a go to for my family! I follow u on Instagram. My go to side dish is roasted sweet potatoes. Really roasted vegetables of any kind! i like you on facebook and follow you on instagram, and follow your blog. 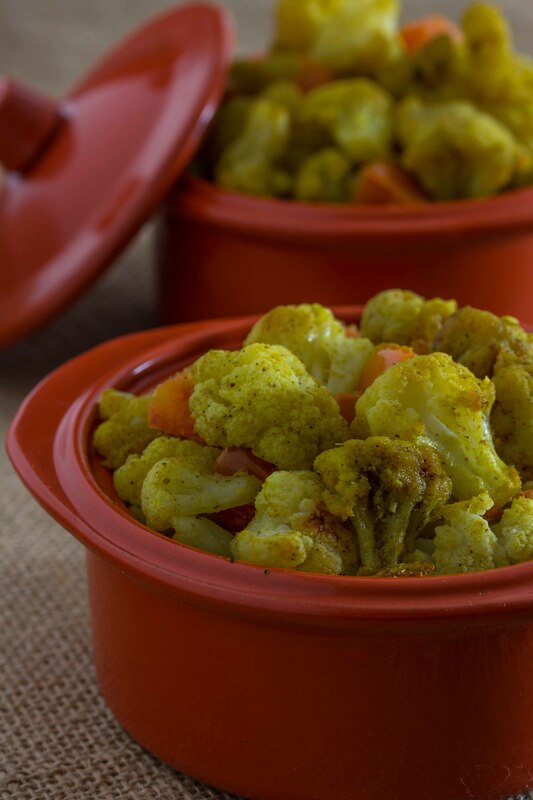 Looks like a great, different, recipe for cauliflower! Thanks! I just started a food blog and I’ve been using yours for inspiration! I love your photos! I follow you on Instagram! I don’t have fb or twitter. My go to starter is always a morrocan tilapia recipe or meat brokea with home made tehina! Entry 1 my go to starter and side is salads! My go to side dish is either grilled zucchini or sweet potato sticks. Slice, spray with oil, sprinkle with spices and broil! go to starter – SOUP! I love, like, and follow your blog! My go to side is sautéed string beans. Delicious! I also follow overtime cook on Facebook. My go to side dish is roasted string beans sprinkled with a little oil, seasoning salt and garlic powder. Looks like my kind of cookbook. 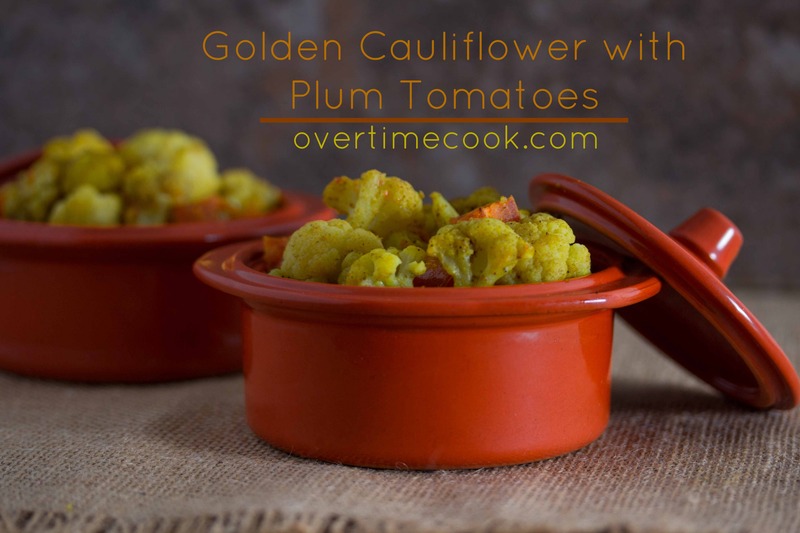 I make cauliflower very often and this looks like a great way to prepare it (my usual is using cauliflower like potatoes in potato salad). absolute fastest side for immediate use- couscous, the tri-color is pretty. favorite is grilled veggies. I follow you on twitter great site! My latest “go to” starter is pastrami egg rolls. A favorite of adults and kids alike. I already subscribe to your email which is great. My go to side is sesame noodles. I hope I win!! U know I follow u everywhere since those unbreaded cauliflower thingies! :). And now on Instagram too! My latest go to starter are pastrami bourekas. Love your blog, signed up for email and facebook! Go to starter is wontons. I follow u on Pinterest! I love your site! It is my go to for anything and everything! Just signed up for emails! Can’t wait! My go to side dish is roasted eggplant. My go to main dish is chicken cutlets and side dish is mashed potatoes. I know, too easy…. I subscribe to your email list. Thanks! Would love copy of this cookbook. I follow your blog and trust your judgement. Roasted potatoes with lots of spices and Dijon mustard. Roasted Asparagus with crispy, sliced shallots and orange zest. A lot of the time, I make potato salad as a starter. I need to be less boring. We’d love to win the cookbook.